By Mickey Rivera. Crossover events are strange, swirling nexuses of nerd energies. In the hopes of capitalizing on the combined adulation of two audiences, publishers have marketed them as blockbuster events that demonstrate the undying expansiveness of a given publishing universe. 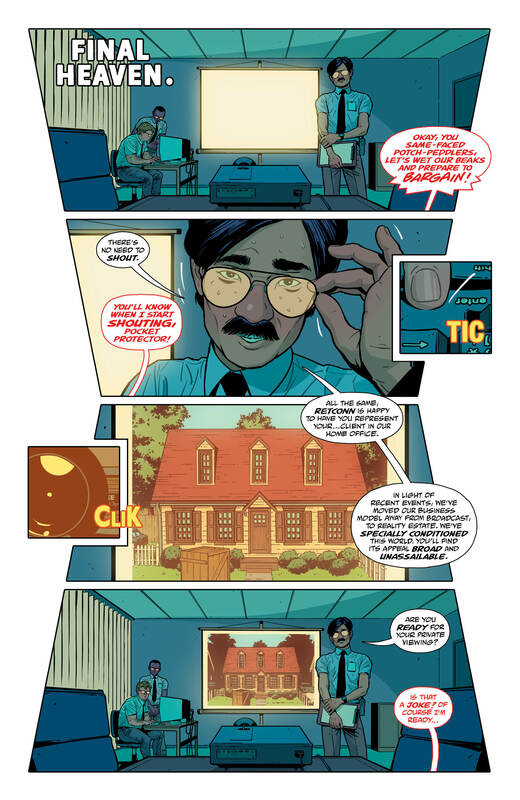 Creators however, like Gerard Way and Steve Orlando, are in it for those sweet nerd energies. The two have been working on properties invented by strangers ages ago, and they’ve both done an amazing job of bringing DC into the modern age. 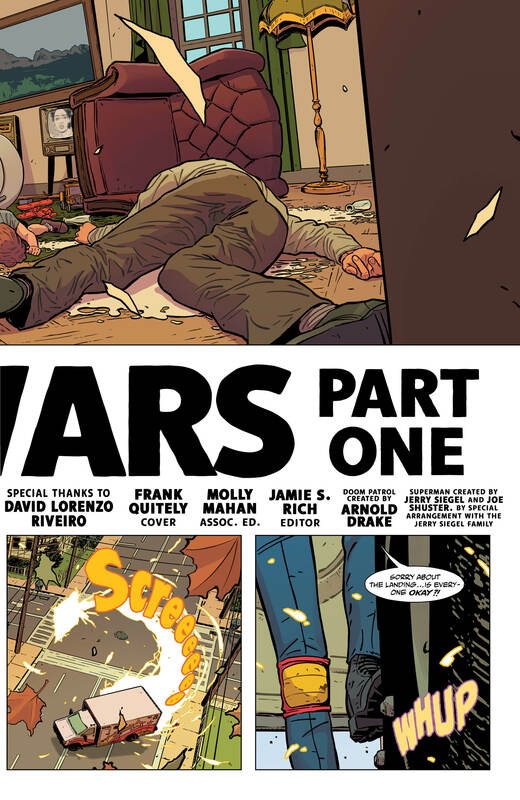 “Milk Wars: Part 1” is the product of two insane individuals with imaginations the size of minor planets, coming together to warp the minds of their combined audiences. In this first installment of their two part epic (Doom Patrol/JLA Special hits stores February 28), the Doom Patrol’s personal problems — in the form of evil corporate demons Retconn — have leaked out of their storyline and into JLA’s hometown, Happy Harbor, Rhode Island. Retconn sells “reality-estate”. They are semiotic gentrifiers who use a transformative milk-like substance to change their imperfect, ordinary properties (and its denizens) into the paragons of safety and politeness typified by 1960’s suburban sitcoms. In this case, old-school JLA nemesis Manga Khan has gone to Retconn to buy up a refurbished Happy Harbor. 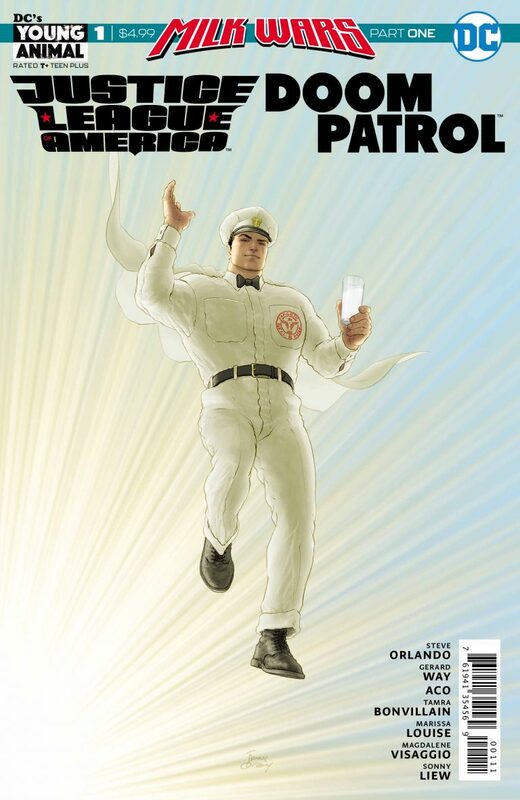 Milkman Man, the hunky milk-bearing godhead pictured on the cover, was created by Retconn out of Superman’s narrative schematics, and spends most of his day going around town shoving milk in people’s faces to keep them complacent. 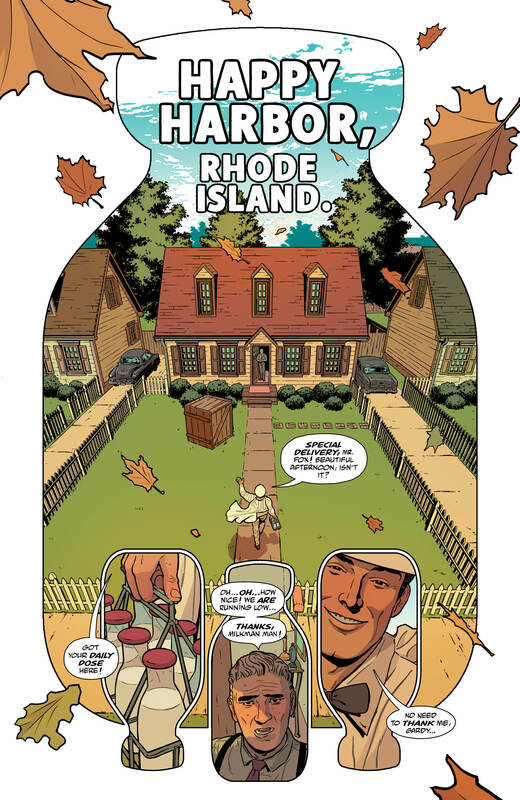 The Justice League themselves have been transformed into their own squeaky-clean versions of themselves and renamed themselves The Community League of Rhode Island. Now, if most of that doesn’t quite make sense to you, it’s okay. This a book to be experienced rather than immediately understood. Way, Orlando, and their team have brewed an alchemical potion with surreal and imaginative power. For 48 pages the two of them throw idea after trippy idea at you until you can barely see straight. 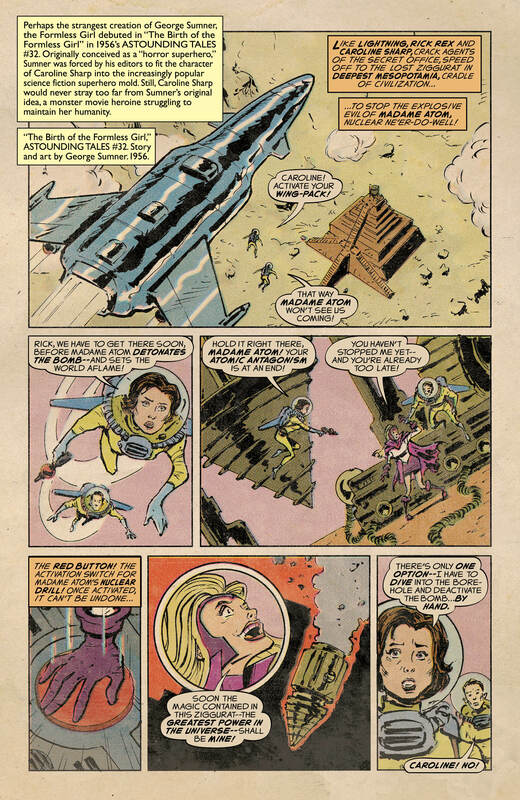 Applying Doom Patrol’s meta-analysis with JLA‘s classic superhero action creates an incredibly potent, self-analyzing comic that calls on its own product history for strength. Strewn throughout are nods to past character incarnations, past artists, even to the founder of DC Comics himself. This is pop-culture cannibalism at its finest. ACO, still possessed by the living spirit of Steranko, makes nearly every page in this book explode with activity and motion. 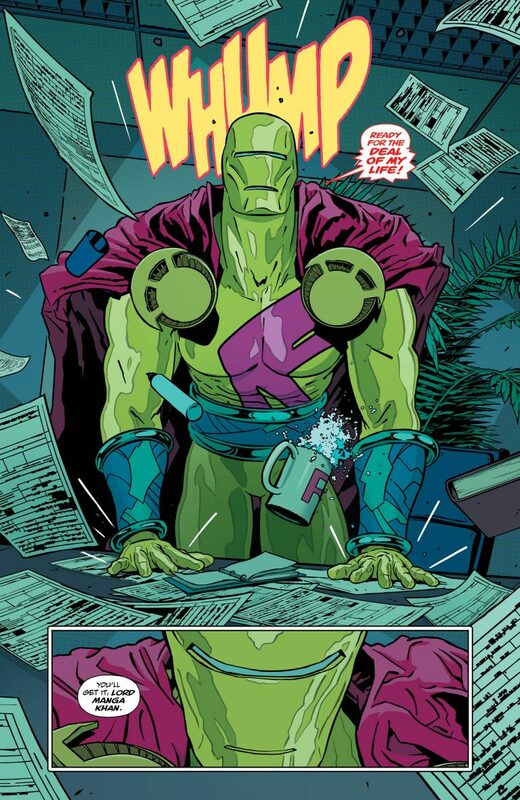 While most have been applauding the three two-page splashes, I personally think the art reaches its high point when Cave Carson comes on the scene and slurps everyone up into his cybernetic eye. Bonvillain and Louise are shine brightest here too, providing the trippiest combination of color and shape you can imagine. This book is very confusing, which I like – but it may turn off regular JLA readers who are used to storylines that are a lot less meta. I sympathize with Gerard Way’s quest to merge oddball sensibilities with the mainstream, which is likely what he hopes to accomplish with the crossover event as a whole. 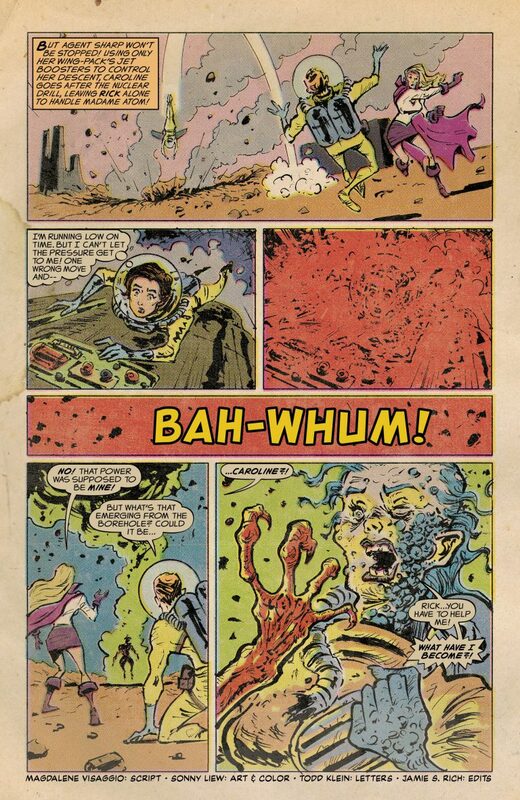 Whether the project will actually succeed in warping the minds of alternative and mainstream audiences alike depends on how the rest of the DC/Young Animal mashups pan out. 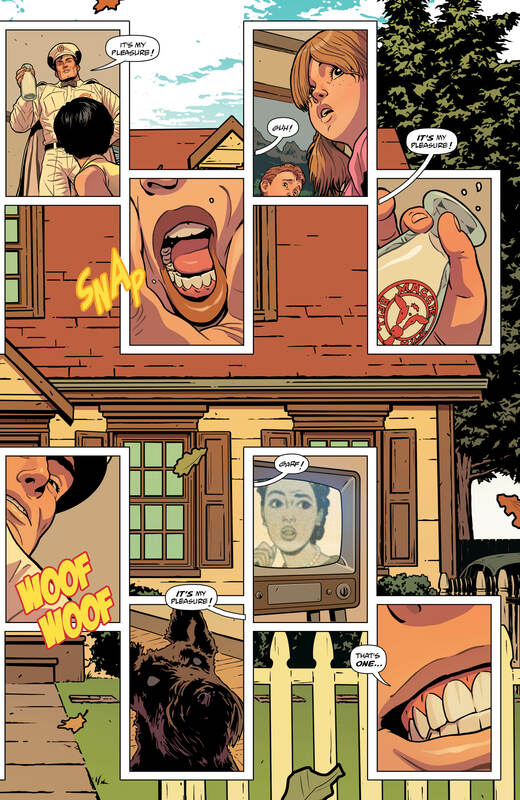 As far as this issue goes, it feels much more like JLA doing a cameo in Doom Patrol than a harmonized synthesis of the two. That’s not a bad thing. You definitely need to read this comic. Just be warned: it’s not for the faint of mind. 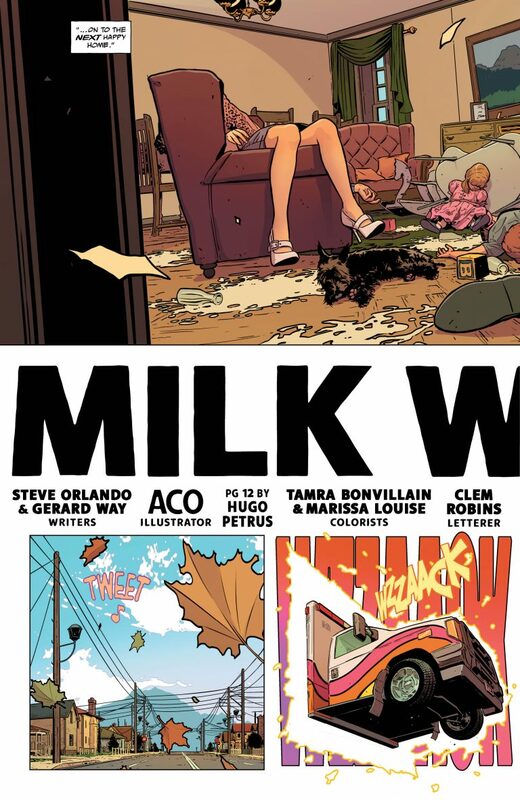 Written by Steve Orlando and Gerard Way. Backup written by Magdalene Visaggio. Backup art by Sonny Liew. 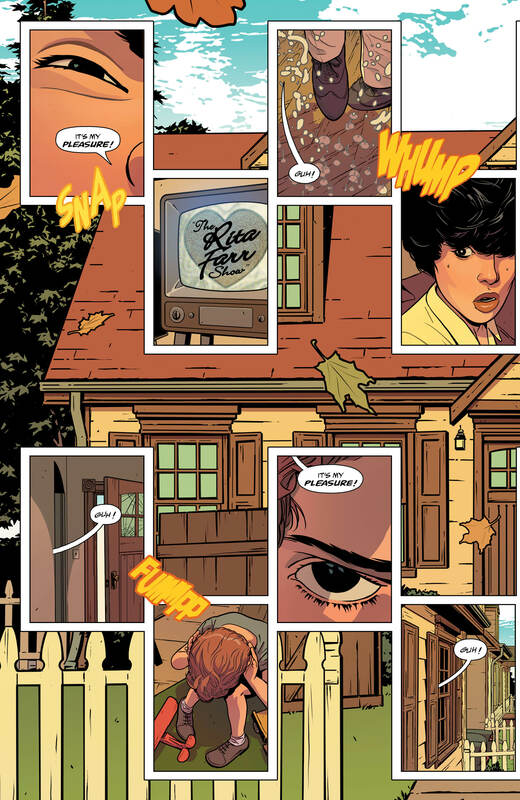 Colors by Tamra Bonvillain and Marissa Louise. 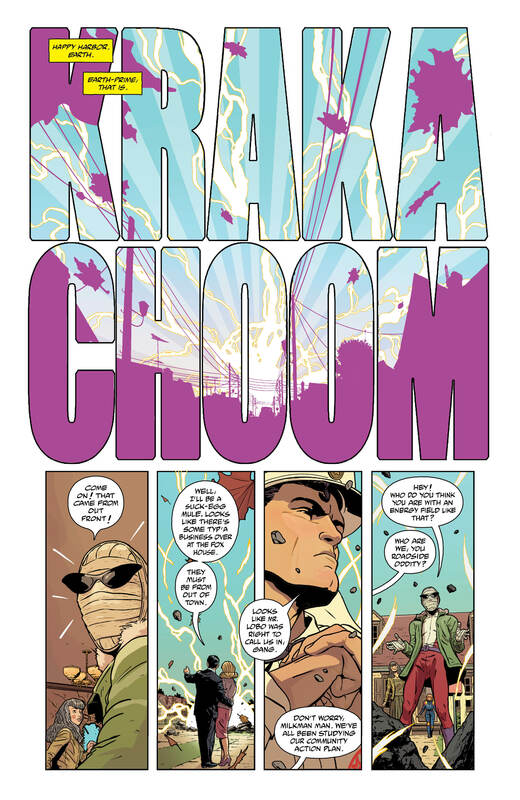 Check out this 10-page preview of ‘JLA/Doom Patrol Special’ #1, courtesy of DC Comics and DC’s Young Animal!